So, everyone who’s ever purchased a bundle or 3 of parsley for Pesach and then still seemed to have a bundle or 3 of parsley left when the Seders were over please raise your hand. Truthfully, except on Pesach most of us use parsley as a garnish and well…..a garnish is just about the only thing that comes to mind. Well hang on to your Hagaddah because this column is devoted to that underappreciated leafy herb that is front and center on your Seder plate and usually left to languish unappreciated in the back of the fridge after yontif. Parley is actually related to celery (sort of like its skinnier first cousin) and the most commonly available types are curly leaf and flat-leaf. The answer to the question of which one best belongs on the Seder plate, the answer is pick the one you like best, either one is fine. As to the taste difference between them, the flat leaf has a stronger flavor and has a stronger fragrance. It is also less bitter than the curly kind. You should look for parsley that is deep green in color and has tight leaves. Clean the parsley like you clean spinach, which is very well and check for bugs! Place it in a bowl of cool water and swish it around then dry on towels. Parsley is great but is rarely, if ever, considered a main ingredient. 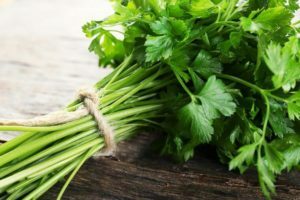 However, impress your friends and family with the following parsley recipes are perfect for Chol Chamode and can be easily converted to be used year around. They let you get creative on a holiday where the menus tend to all be the same old same old matzo centric dishes. As a final plus for parsley, you’ll be able to say you’re eco-friendly by keeping it “green”. 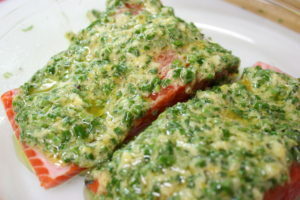 Note: parsley should be added at the end of the cooking process so that it retains its flavor and color. One great parsley trick is that if you’re making a lighter colored sauce just use the stems instead of the leaves as it will give you the flavor or parsley but not the green color. In a saucepan melt the butter and then quickly whisk in the flour. Cook for one minute, whisk constantly. At this point whisk in the milk, cheeses, pepper and parsley. Cook, whisking constantly until combine and the cheese is melted (1 to 2 minutes). Serve immediately. Makes about 2 1/2 cups. In a large bowl combine the lemon zest, lemon juice, salt, and pepper. Whisk in the oil until combined. Add the mushrooms and mix to coat. Let sit for at least 20 minutes. In a bowl combine the eggs with the salt and pepper. Mix to combine and add the cauliflower Toss to coat well. Put the parmesan in a large bowl. With a slotted spoon place the cauliflower into the cheese, tossing to coat. In a large skillet heat the oil until hot but not smoking. Cook the cauliflower in 3 to 4 batches. Turn occasionally, until golden on all sides, 3 to 4 minutes per batch. Remover from the oil, drain on paper towels and cool slightly. In a serving bowl combine the mushroom mixture with the parsley and cauliflower. Mix gently and serve, Best served warm Serves 8.